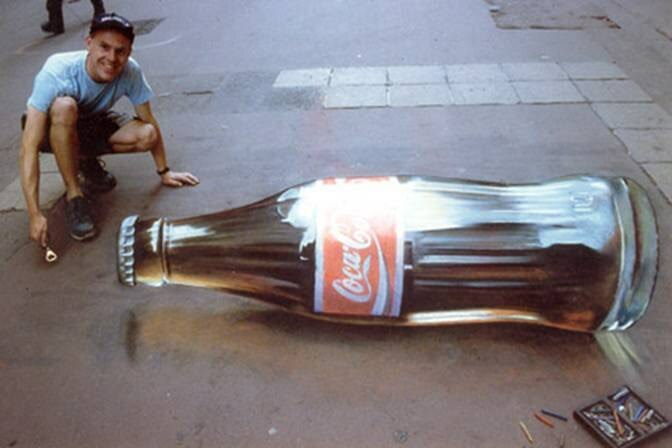 What this guy does with chalk is UNREAL! Just got this e-mail and couldn't believe the detail. It's unreal! It's done with chalk. Re: What this guy does with chalk is UNREAL! I need that guy to do the side of our garage!! Yep, my mom forwarded the email to me. The globe one is unbelievable. Wow. Ya gotta laugh at the guys who are walking around the "hole" in the sidewalk. I could do that if I wanted to. I just don't want to. That's amazing. What's as amazing is the shot of what the wrong angle looks like. I mean it's hard to distinguish. Not too shabby. I guess he gets paid to do pictures of products? Like coke or sony. What a way to make a living. Imagine what he could do for an SKA sponsor's wrap! being two dimensional, I am thinking they ONLY look good from one direction to get the 3-D effect. Now there's a homeless guy making good use of all that free time. View Next Unread Dancing with the Stars?? ?